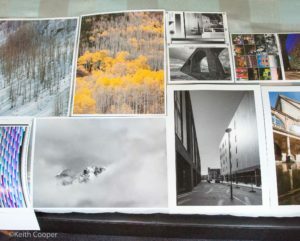 In a recent review of Fotospeed’s Platinum Baryta 300 paper, Keith looked at printing a number of images at A2 size (~16.5″ x 23″). Whilst a modern 50MP camera can easily manage the resolution needed for such prints, what about photos you took a few years ago where there just were not the number of pixels? Judicious use of image re-sizing software can make a real difference, where it counts – the print. 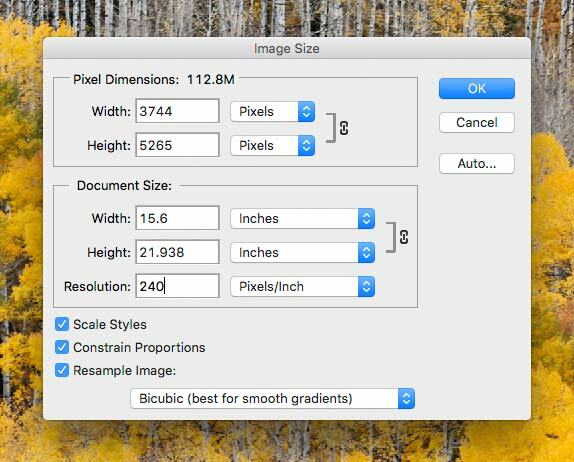 Before starting off, I should note some of the commonly perceived limitations when it comes to making big prints from smaller image files. 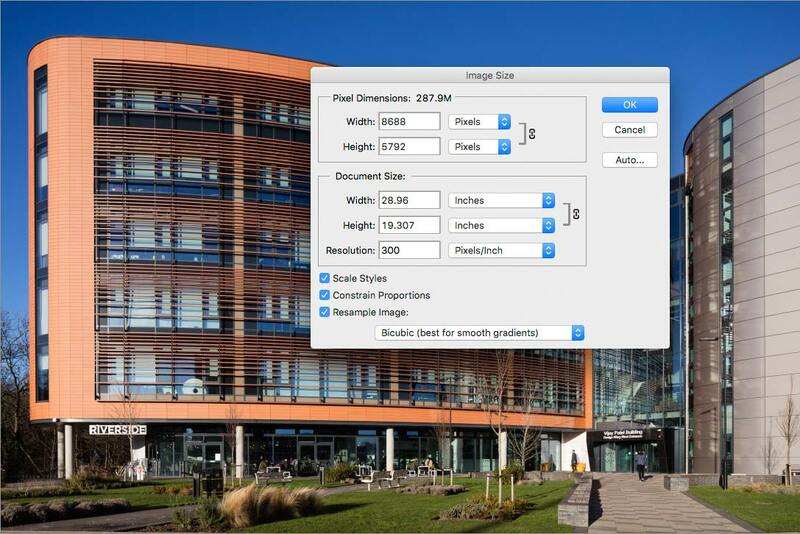 Do you need at least 300ppi of image resolution for a print? So it’s often said… Here’s a 50MP image from my Canon 5Ds, opened in Photoshop, looking at how big it is. 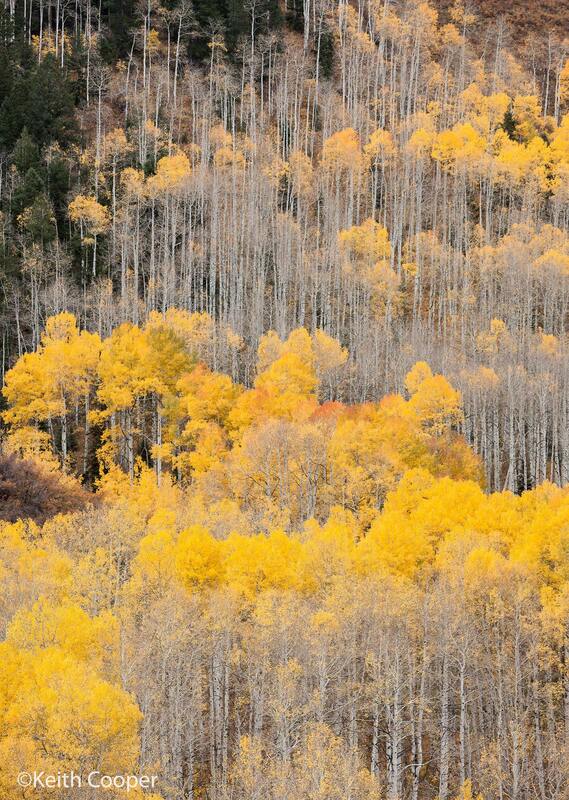 As you can see, I can get a print at 29″ x 19″ right away from this image. 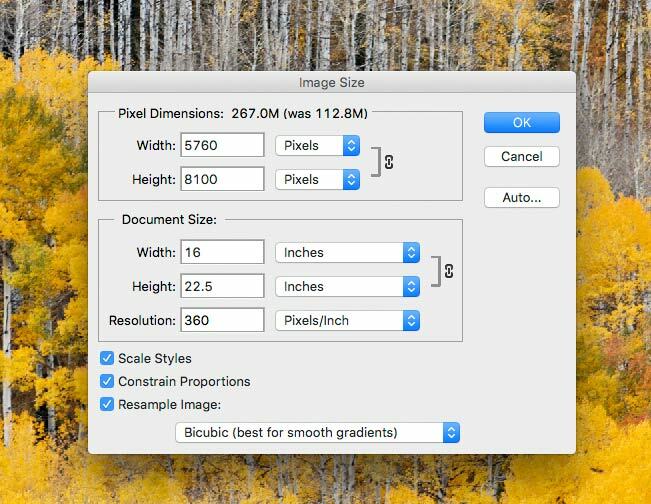 If I simply resize it to 24″ x 16″ then the resolution goes up to 362ppi. Experience from printing tells me that dropping the ppi figure to 240 is fine for larger prints, since we tend to view them from farther away. That’s not to say I use 240 by choice, just that for many images you can still get a good print. 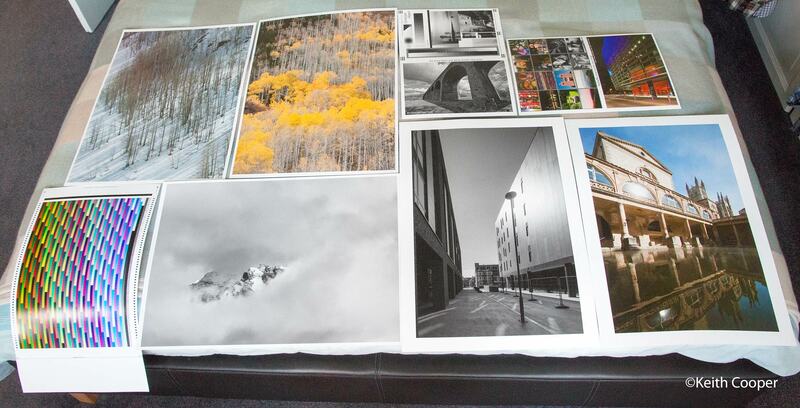 At our chosen 300ppi we can get a 13″ x 9″ print. Expanding this to 16″ x 24″ drops us down to around 170ppi which is rather too low unless you’re making much larger prints, only viewed from quite a distance. I first addressed this in an article (from 2006) looking at minimum print resolutions for different viewing distances where that 170ppi might be OK, if I knew no-one was getting closer than 5-6 feet. 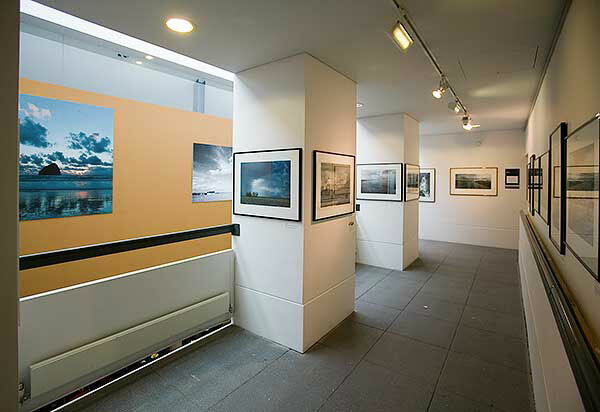 I made use of this at an exhibition, where the large (~66″ x 40″) sunset print at the left was made directly from a 1Ds image, knowing that it would only be viewed from across the balcony (10 feet minimum). In the 5Ds print comparison article I used relatively basic resizing and upscaling and discovered that whilst it was much easier to make big prints from more megapixels, you could still get good results from simple upscaling. The process depends on having a good quality image to start with. This is where I’m really glad I went for top quality lenses right from when I first got my 1Ds in 2003. If I’ve been able to make bigger prints from older photos for the last 15 years, then what’s changed? It started with wanting to make some big prints for my recent review of Fotospeed’s Platinum Baryta 300 paper. I’d a box of A2 paper and naturally looked at some of my 50MP 5Ds images, where if the picture was technically OK (exposure/shake etc.) then I could pick almost anything I liked and get a good print. Even with 50MP files I’ll probably do a bit of editing and a bit of selective sharpening before printing, but there’s usually no shortage of detail at the resolution I want. However, from 2003-2007 I had the 11MP Canon 1Ds and from 2007-2015 a 21MP Canon 1Ds mk3. I’ve got quite a lot of images I like from that time (it covers many of my trips to the US) and it would be nice to get the level of fine detail I’m now accustomed to from the 5Ds. With the older cameras, the detail simply isn’t there, so I need to re-size or upscale my images. 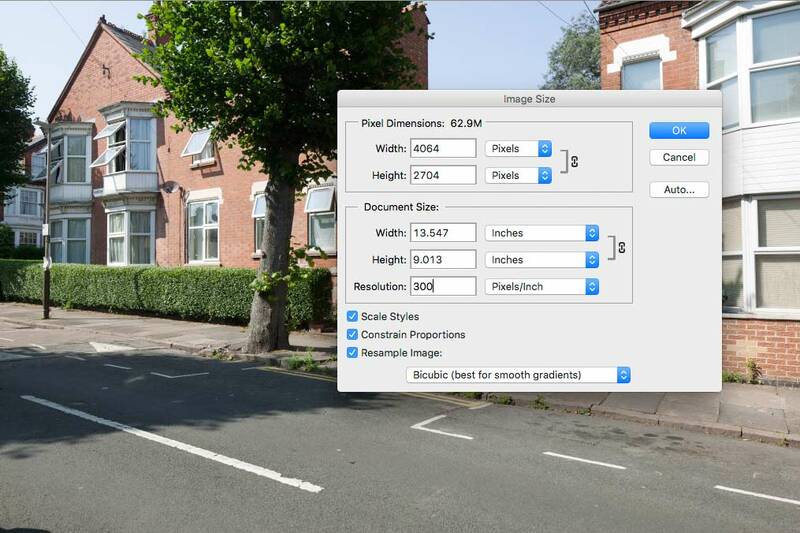 That’s where Topaz AI Gigapixel comes in as a very helpful tool (30 day free trial available). Over the years I’ve tried many techniques and tools for re-sizing images, there are a lot of them. What I realised when testing AI Gigapixel for my review last year was that for some images it was generating plausible additional fine detail that looked very realistic. In my recent print testing I decided to use it to not just let me make larger prints, but also to print them from images at a relatively high 360ppi. However, as I discovered, not all parts of images rescale so well, so more work is needed. 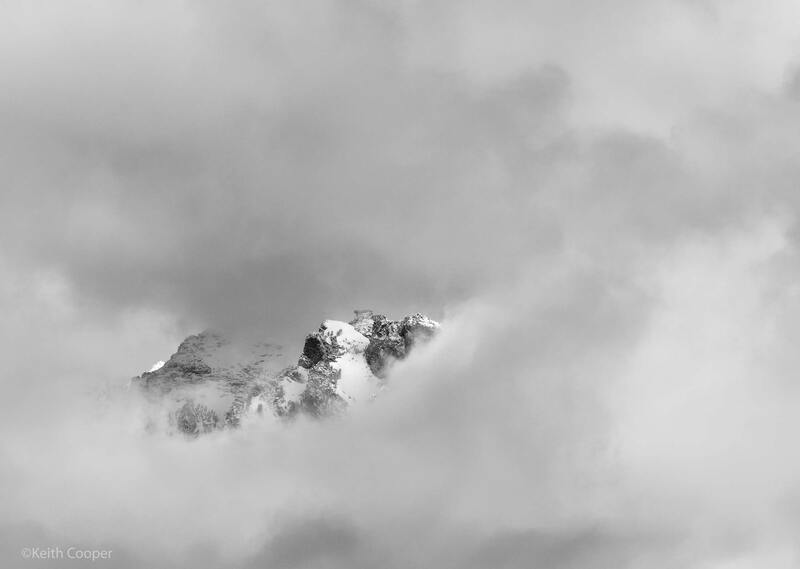 As an example, let’s take this image of a small part of the Tetons showing through cloud, taken back in 2004 with my 1Ds and EF 70-200 F2.8L IS lens. I’m using DxO Photolab for RAW processing here, but I could have also used ACR in Photoshop. The RAW file was saved as a TIFF file (16 bit, ProPhoto colour space) without much adjustment. This is the final B&W version I printed. What about Lightroom? 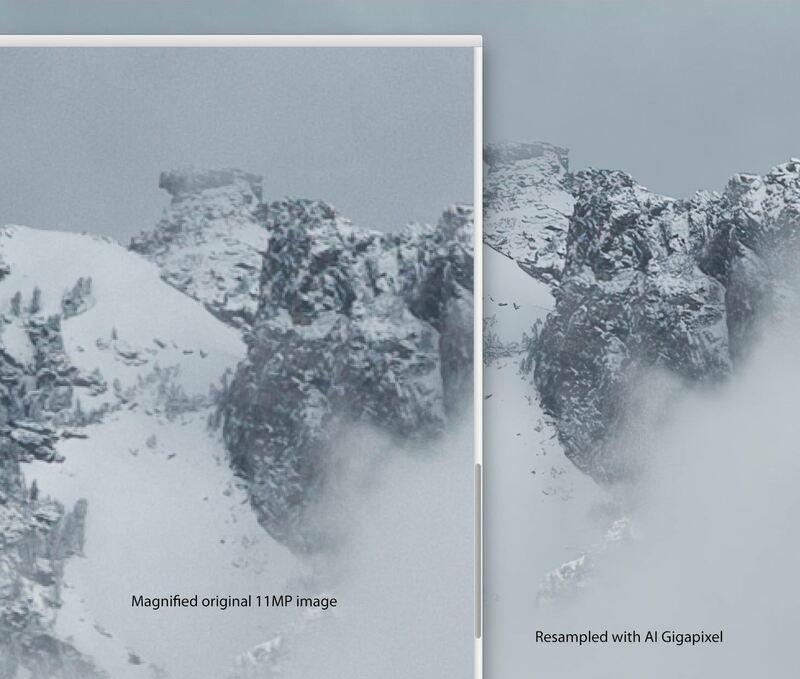 You can do the RAW conversion and export as a TIFF file for use with AI Gigapixel. How you process the result is up to you, but Lightroom has no part in my large print workflow, where I make use of Photoshop stuff such as masked adjustment layers and selective editing/sharpening. IMHO it’s fine for small prints (up to A3) but far too inflexible for large, and especially very large prints. However there is slight sensor pattern noise in the Canon 1Ds (it was the first full-frame DSLR). Normally, with good exposure, this isn’t an issue, but the Topaz resizing has picked it up and boosted its visibility. 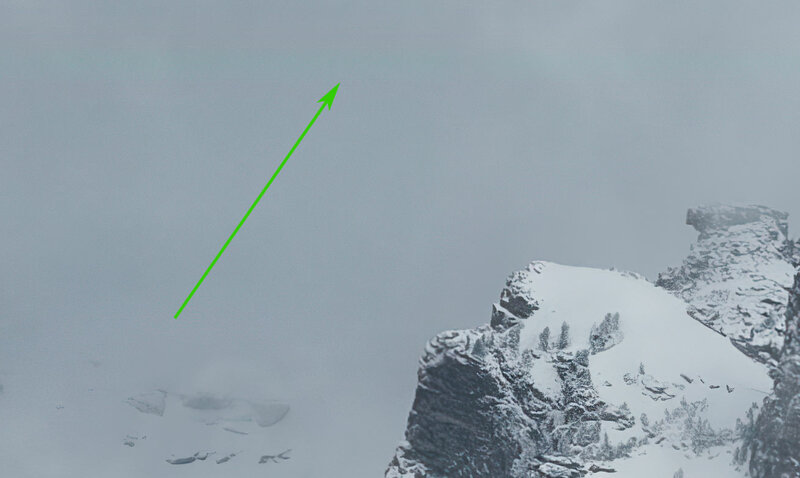 You can see the horizontal band above the arrow. 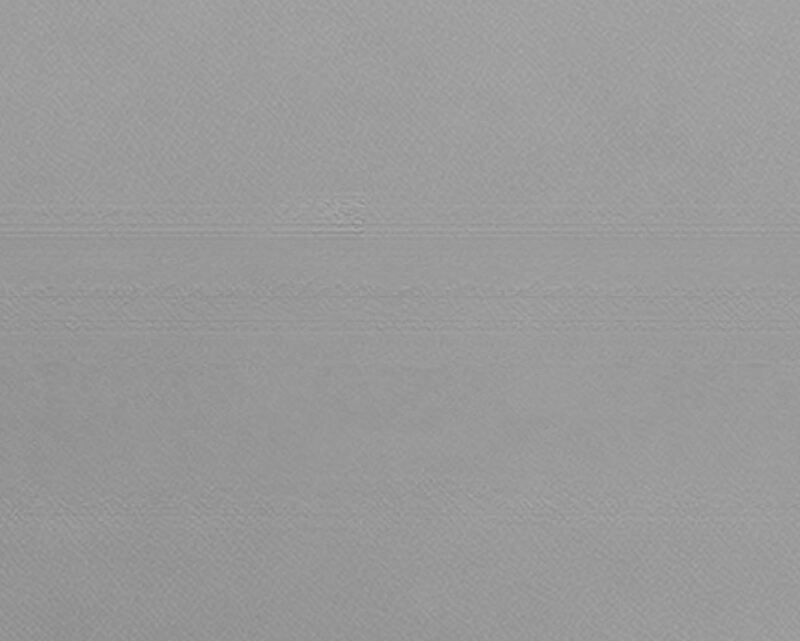 Converting the image to B&W and magnifying further, shows the band even more clearly. I noted that this only shows in large flat areas of the image. It’s likely elsewhere too but at a level it doesn’t show. It’s possible that slight adjustment in RAW processing (noise reduction/sharpening) might make this less noticeable, but reminds me once again how upscaling output depends of what’s going in. The answer (for this image) was to enlarge twice, once with a simple bicubic smoother setting in Photoshop, and once with Topaz AI Gigapixel. The AI GP one is placed over the other one as a layer, with a mask, letting me ‘brush in’ the extra detail I want. 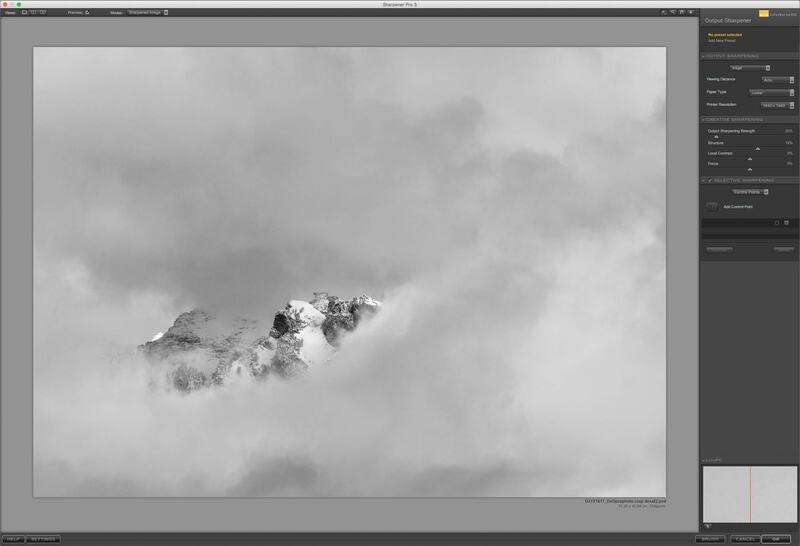 Remember that clouds are soft, they rarely have fine detail and often benefit from having no sharpening of any kind applied right from RAW processing to printing. Once I’ve the image adjusted for tonality and contrast, I run a light application of Nik Sharpener over the image for print sharpening. 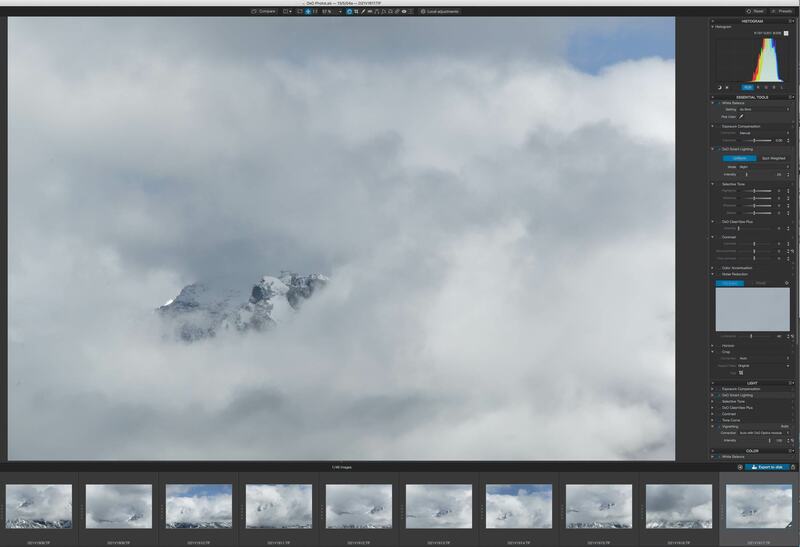 Applying a touch of sharpening just to the mountain makes it appear even sharper and avoids sharpening residual noise in the large flat areas of cloud. I’ve used Nik Sharpener for many years, and was pleased to see DxO taking over its upkeep and development. It lets me choose where sharpening is applied and just as importantly, where it isn’t. The files from my 1Ds3 are a lot easier to work with. There is less noise and we have more pixels to start with. I don’t need to upscale very much at all – this is the default size. As you can see, I’m almost at the size I want with 240ppi. However, this image has a lot of fine detail. 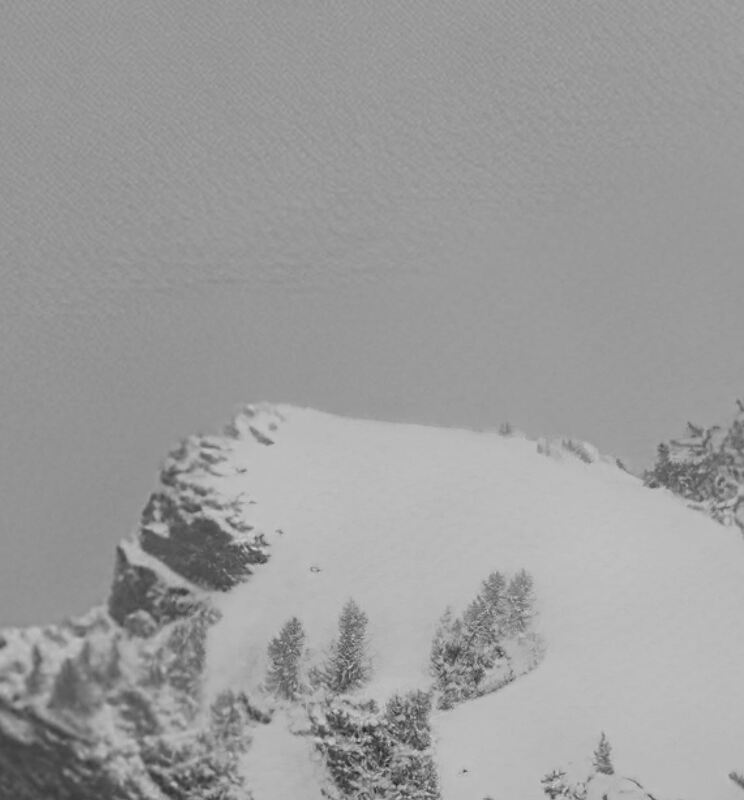 I know that AI Gigapixel handles detail like the tree trunks and leaves quite well, so upping print resolution to 360ppi may give a bit of extra perceived sharpness to the final A2 print. The new version of the image has a lot more ‘definition’ in the fine detail. It’s important to remember that I’m doing this to make a better looking large print. When it comes to how I process my images for print, this is always my number one consideration. This is the image that was printed. The print has the feel of one I took with a much higher resolution sensor. Now you could say that if I want such detail then I should use a better camera and lens. More than ever I’m glad I always keep my original RAW files. The advances in computational image processing we’ll see over coming years will make this example seem relatively trivial, but I’ll always remember that to make a great print, you really do have to have taken care with the original photography too. The paper I used in these experiments was Fotospeed Platinum Baryta.